Up to 75 guests got to see at first hand the latest in mooring related technology during ONS in Stavanger at the end of last month courtesy of Viking Moorings, a provider of total mooring solutions to the offshore oil and gas industry. 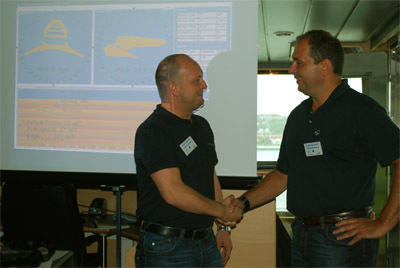 The guests, who included a range of representatives from E&P operators and drilling contractors, the Norwegian Maritime Directorate, the Petroleum Safety Authority, and partners, such as Det Norske Veritas, were aboard the Farstad Anchor Handling Vessel (AHV), Far Scorpion, for a day trip up Gandsfjord, west of Stavanger. Following pre-operation and safety briefings, the following innovative new anchor handling solutions were demonstrated. • An anchor was set with Vryhof Anchors’ new Stevtrack Anchor Data Acquisition System, providing a real-time overview of the anchor installation process on the seabed and faster anchor installations in real-time. With Stevtrack, a transponder unit on the anchor communicates with a setback monitor on the AHV, displaying real-time data on variables, such as roll, pitch, drag length, penetration depth and pull-in force. The system can also confirm when the anchor is positioned correctly on the seabed and avoids the need for anchors to be reset, saving both time and money. The system is also particularly applicable in harsh, offshore conditions. As part of the demonstration, a 15 tonne Vryhof Stevpris Mk6 anchor, supplied by Vryhof Anchors, was launched over a stern roller and lowered with the anchor’s orientation monitored on a setback monitor. Already, Viking has signed a contract with Vryhof Anchors for Stevtrack to be installed on a set of anchors which will be used for drilling rig operations. • The second demonstration was of The ‘Spin’ Buoy, a revolutionary new product to enhance the anchor retrieval process, where a submerged buoy can be brought to the surface using a coded acoustic signal The signal will release the buoy, while the hydrodynamic fairing forces the buoy to rotate, paying out rope. The rope is connected to the rest of the mooring line making it easier to retrieve the anchor. In the demonstration, the ‘Spin’ Buoy was launched in 180 meters of water depth, was acoustically released, and arrived at the surface less than two minutes later. 180 meters of wire, 250 meters of chain, and the anchor itself were all brought to the deck. • Finally, Smart Installations’ ControlCutter solution was demonstrated - a device that cuts chain in less than three seconds. With safety and the ability to handle large anchors in deep waters such a prevalent issue in the industry – particularly following the Bourbon Dolphin tragedy in 2007 where the ship capsized while anchoring a semi-submersible drilling platform – ControlCutter will ensure that anchor chains can be cut immediately. Copyright 1973-2013. Scandinavian Oil-Gas Online. ISSN 1500-709X.